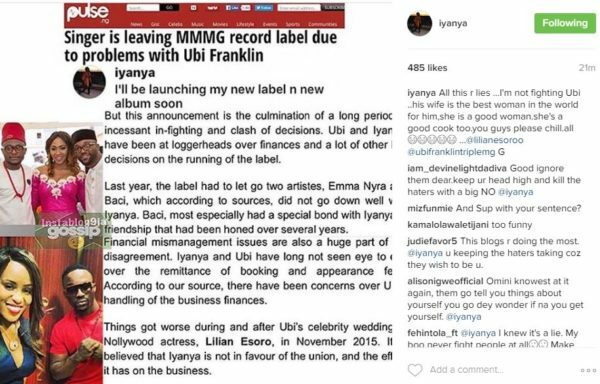 Over the past few days, ever since Iyanya put up a post that he was starting his own record label, there have been rumours that he and his business partner Ubi Franklin had a falling out because of Ubi Franklin’s wife. Iyanya has come forward to debunk those rumours. He posted a screenshot of the news on Pulse NG and wrote “All this r lies …I’m not fighting Ubi… his wife is the best woman in the world for him, she is a good woman. She’s a good cook too. You guys please chill…@lilianesoroo@ubifranklintriplemg G”.